Corsa orders have tripled in Germany. GM Europe factories in Germany and Spain have been helped by government incentives schemes to boost new-car sales. GM Europe's Opel unit has stopped short time working at its Eisenach factory in eastern Germany after a government scrappage incentive increased demand for its Corsa small car, which is built there. 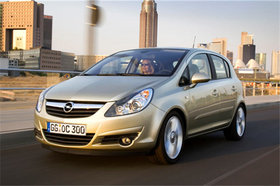 Opel spokesman Andreas Kroemer said Opel had received around 21,000 orders for the Corsa during February, up from a normal 7,000. In Germany, consumers who swap a car at least nine years old for a new vehicle can receive 2,500 euros, making small cars more attractive to new customers, Opel said. Eisenach had an extended Christmas shutdown and had two non-production weeks during February. But the factory will now return to a full three shift operation and management is talking to unions about extra shifts and possible weekend work to meet the demand, Kroemer said. Matthias Wissmann, the head of the Germany's VDA car industry association, said the scrappage incentive could boost German auto sales to about 3 million this year. In December, the VDA said it expected car sales in Germany to fall to about 2.9 million this year from about 3.1 million in 2008. GM's Zaragoza factory in Spain, which also builds the Corsa, is busy thanks to scrappage incentives that have been introduced in France and Italy. Zaragoza is back to full production after having an extended Christmas production halt and some non-production days. "It's working around the clock in the three-shift operation," Alain Visser, Opel's head of marketing, said. Earlier this month, Visser said he would like to see a scrappage scheme adopted in the UK, which is GM's biggest European market.